The HTC Evo 4G is an awesome smartphone with its 4G data network, Wi-Fi hotspot tethering, large high resolution display, fast 1GHz snapdragon processor, 512MB memory, 8MP camera with dual LED flash capable of 720p video recording and front facing vga camera for video chat. Hardware wise, it is the current top of the line smartphone (with how fast Android moves there will always be something better in a month or two), but all this power isn't free, it comes at the cost of battery consumption. There is a lot of false claims online regarding the "abysmal" battery life of the Evo. This was started by a blogger who reported getting 10 hours out of the device while using it for checking email repeatedly, using GPS navigation, listening to music and watching tv. He was also using Advanced Task Killer, which is known to use more battery than it saves. Can someone please explain to me how 10 hours doing all that is bad battery performance? Regardless, complaints have escalated with people now claiming their Evo's die in 3-4 hours from a full charge and cannot even last a night sitting idle in standby. I personally believe most of these claims are coming from the likes of iPhone fanboys who feel threatened by the Evo (or other featured Android smartphones) which have never actually set their hands on the device and are just spreading F.U.D. about the internet in an attempt to defend their "magical" IDevices. The battery on the Evo is 1500mAh, as far as I know it is the largest standard cellphone battery, but I haven't researched it that much. It is fully capable of making it through an entire day with moderate usage and uses very little power draw at idle even with the sub-optimal default settings. With just a few settings tweaked and a little knowledge of the Android operating system, you can get well over 24 hours of use on a single charge without the need of larger batteries, addtional batteries or usb charging packs (although those options are available if you need them). New batteries take several charge and discharge cycles to reach full capacity, so the first thing you should do with your Evo (or any mobile device) is turn the power on and let the battery drain completely then charge the battery to 100% with the power turned off (don't worry, a full charge only takes ~2 1/2 hours from 0%). This is the quickest way to condition your battery and should be repeated every few months to keep the battery in tip-top shape. With the battery conditioned, phone booted and on the home screen, press the Menu button and then press Settings. Press Wireless & networks, then press Wi-Fi settings. Un-check Network Notification. Network notification constantly scans for open wireless networks to connect to whenever Wi-Fi is turned on, this scanning is a major draw on battery. With network notifications turned off, you can still connect to any wireless hotspots you have previously connected to just by turning Wi-Fi on and being in range. To add a new wireless network in the future, return to this screen and it will scan for any access points within range. Press on the network name to connect and it will be saved for future use. 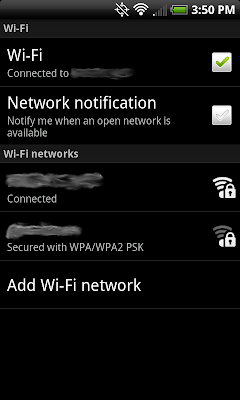 From the Wi-Fi settings screen, press the Menu button and then press Advanced. Press on Wi-Fi sleep policy and set it to Never. Wi-Fi data requires less power draw than 3G data services and very little draw at idle, however by default the Wi-Fi shuts down shortly after the screen is turned off. If you have any services or applications still running, the phone will try to re-establish a Wi-Fi connection and then disconnect again any time data is requested. This constant connect and disconnect requires way more power than just leaving Wi-Fi idle. Return to the Wireless & network settings by pressing Back twice and then press 4G settings. From here un-check Network notification. Similar to Wi-Fi network notification this constantly scans for 4G networks in your area to connect to. 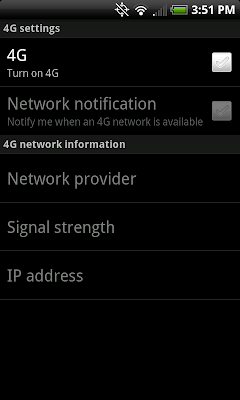 4G is a power hog and constantly scanning is even more so. You should only be using 4G when you need the increased bandwith and turning 4G on will automatically connect to the best 4G network in range so it should not need to constantly be scanning. Press back twice again to return to the main Settings screen and press Sound & display. In here un-check both Phone vibrate and Haptic feedback. Phone vibrate is self-explanatory, it vibrates the phone when it rings, the vibration is very weak and with your volume set appropriately the phone will be audible. It will still vibrate in silent mode with this turned off. Haptic feedback vibrates the phone under your finger when you press on buttons, it makes the phone seem more responsive but each vibrate takes extra power draw. This does not turn off Haptic feedback for the keyboard, only the OS. The phone might seem bland after disabling it, but you get use to it quickly. Continue down this list to the Display settings and press Brightness. Make sure Automatic brightness is checked (the default setting) and press OK. Now press on Screen timeout and set this to 1 minute (default setting) or lower. These are pretty self explanatory. 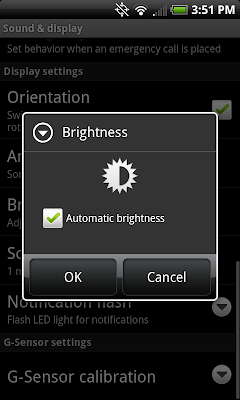 Automatic brightness will automatically adjust the brightness depending on the ambient lighting. 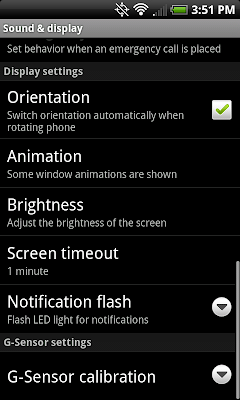 I have always found the screen to be readable outside in direct light or in bed with lights out using this setting. Return again to the main Settings by pressing back and press Accounts & sync. Go through the list of applications listed and set the syncing schedule for each to an appropriate timeout. I have weather at 1 hour and everything else at 2 hours or Never. I prefer manual syncing so I am not disturbed constantly by email, facebook, twitter or news updates since I am at my desktop all day and already get notified of such events. When I am away from my desktop, I use the phones applications to manually check for updates when needed. Set these to whatever is appropriate to what software you have installed and how you use them. DO NOT USE TASK KILLERS OR OVERCLOCK UTILITIES. Android is perfectly capable of managing your memory and running processes all on its own without user intervention. It will gracefully close down applications that are idle or when more resources are needed. Task killers run in the background, constantly polling for applications to force close. 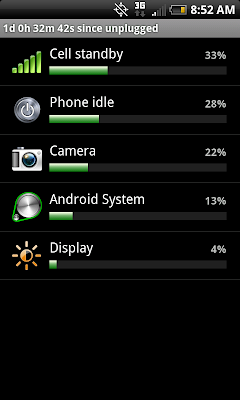 This eats up way more battery than it saves. In the rare case that you do need to force close an application you can do this by going to Settings > Applications > Manage applications, press the application, then press force stop. Android will also automatically underclock the processor to the minimum required level needed and to almost nothing when the screen is off and no applications are active. If an application is constantly running in the background when it shouldn't, uninstall the application, rate it poorly and leave a comment to the developer to fix their application. Use the Sense Widgets or Android Power Toggle widget to toggle 4G, Wi-Fi, Bluetooth and GPS on and off as needed. 4G uses a lot of battery to feed that up to 10Mbps connection, only enable it when you need the extra bandwidth. Wi-Fi can generally be left on as it uses little draw at idle and less draw than 3G for data, but if there will be no Wi-Fi networks in range for a while, turn it off. Bluetooth should only be on when its being used period. GPS uses no power if no applications are currently requesting location data from the API but make sure you close any applications that require a constant GPS lock, I prefer to use cellular location data instead for general location unless I need fine location which requires GPS such as Google Navigation. If you know you will be away for an extended period of time without the ability to charge also turn off auto-sync for all applications. Use the power button to turn off your display instead of just letting the screen timeout take care of it. Sure, this isn't a big thing especially if you have your screen timeout set low, but every minute your screen is on idle, is another minute you can't use it later. Use the Back button to exit applications instead of the Home button. This tells Android you are done with the application and to either close the activity immediately or give it priority to close when resources are needed. Pressing the Home button keeps the activity running as normal. Install the application Spare Parts from the Android Market. Use it to keep an eye on applications requesting a Partial wake lock. This means that those applications are requesting the phone to stay awake even when the screen is off, preventing the phone from ever going fully to sleep. 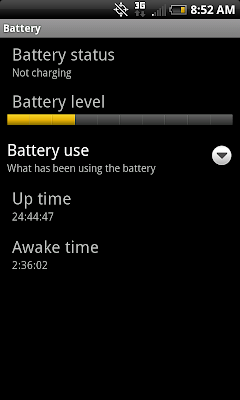 Open Spare Parts and press Battery history, then select Partial wake usage. All applications will use a partial wake lock at some point, but keep an eye on this list for anything that has a high percentage of wake locks and either check the settings of that application or remove it and vote it down in the Market, the app is broken. You can disable Sense UI and run the vanilla Android interface which will increase the speed (as if the phones aren't fast enough already) and battery life (should be acceptible if you followed the other recommendations). After using Sense, the vanialla Android interface seems lacking, but its acceptable and will greatly improve when Android 2.2 (Froyo) is released for Evo "Very Soon". 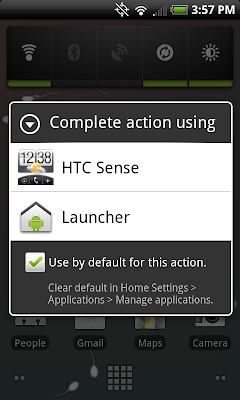 Do disable Sense UI go to Settings > Applications > Manage Applications > HTC Sense. Press Clear defaults then press Force stop. When you return to the home screen, check the Default checkbox and press Launcher. To enable Sense UI again, repeat these steps but clear defaults and force stop Launcher instead of HTC Sense. There is an update planned for the week of June 28, 2010 which fixes a known bug with Facebook syncing in Sense UI and will improve battery life. When Android 2.2 (Froyo) hits the Evo "Very Soon", the battery life will be improved significantly. With everything that these phones are capable of, the battery to the contrary of what some bloggers will have you believe, is actually quite amazing and will last longer than any "magical" smartphone. Keep in mind batteries DO die. If you have done all of these suggestions, and you are truly seeing poor battery life, you have a bad battery, have it replaced under warranty. I hope this post was useful to you, if you have any other suggestions please leave them in the comments below. thanks very much for these information. I find them very useful.